First day back to Boot Camp - the beginning of our four week Summer session. We had a lot of new people in the group today (looked like over 130). 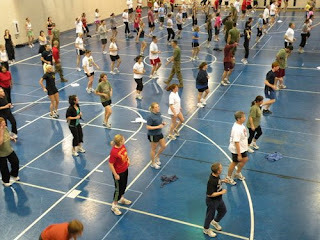 After the run we hit the tennis courts and got in a box formation. The workout was non stop and I noticed a few people dropping out. I can not remember ever seeing so many people just sitting down next to the fence during a workout. I went over to a group of four girls and got them to stand up and just walk in place. One of them looked like she was going to puke at any moment.